This Magic Whiteboard Sheets 8" x 12" (Pack of 20) will revolutionize the way you think and use notes. With this Magic Whiteboard Sheets 8" x 12" (Pack of 20), you have total note-writing freedom. 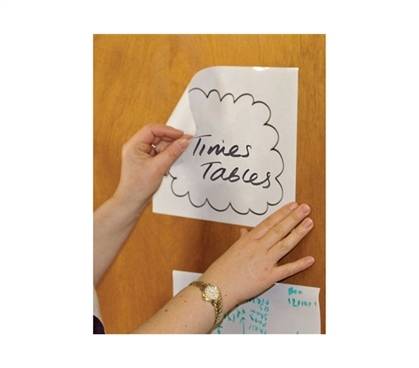 This college dorm wall decor accessory Magic Whiteboard Sheets 8" x 12" (Pack of 20) sticks to any surface without tape or tacks—and, it doesn't leave a trace of itself on any surface. Since dorm rooms have such strict rules about decorating dorm walls, this Magic Whiteboard Sheets 8" x 12" (Pack of 20) is the perfect dorm room safe product. Add this Magic Whiteboard Sheets 8" x 12" (Pack of 20) to make life easier for yourself. You'll inevitably need to write yourself little reminders, or notes to your dorm roommates. This Magic Whiteboard Sheets 8" x 12" (Pack of 20) is an essential college product and should be on everyone's dorm survival kit.